Hot and sunny days in summer can make it really difficult to stay cool. It’s not really easy to maintain the cool of your home and body. But there are certain ways to beat the heat and stay cool this summer. 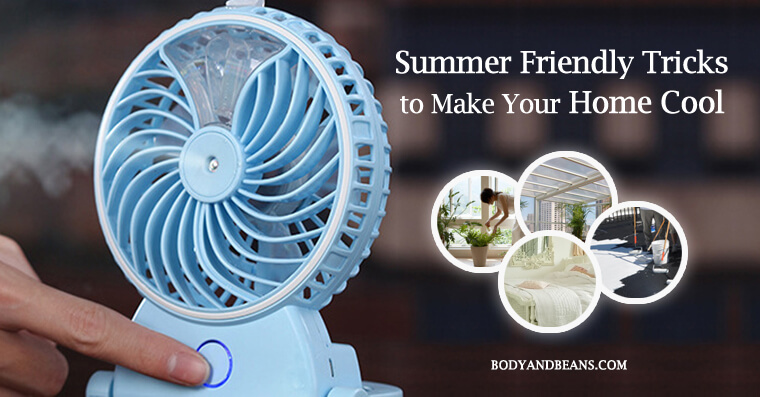 In order to stay cool in summer, not only you have to eat summer friendly foods and beverages, but also have to find ways to make your home cool. Unless the house is cool, you may not be able to beat the heat comfortably. Drinking plenty of water throughout the day, keeping the windows closed, using cotton curtains, having lots of fruits and vegetables etc can seriously help you beat the heat and stay cool this summer. Today in this post, we are going to talk about some of the best summer friendly foods, beverages, habits and tricks that’s gonna help you stay cool this summer. There are many foods and herbs like watermelon, cucumber, mint etc that can help you to stay cool in summer. Nature gives us food and herbs according to the season, because the nature wants us to balance our diet accordingly. When it’s hot outside, we should eat summer friendly foods. When it’s cold outside, we got to eat winter friendly foods to keep ourselves warm. 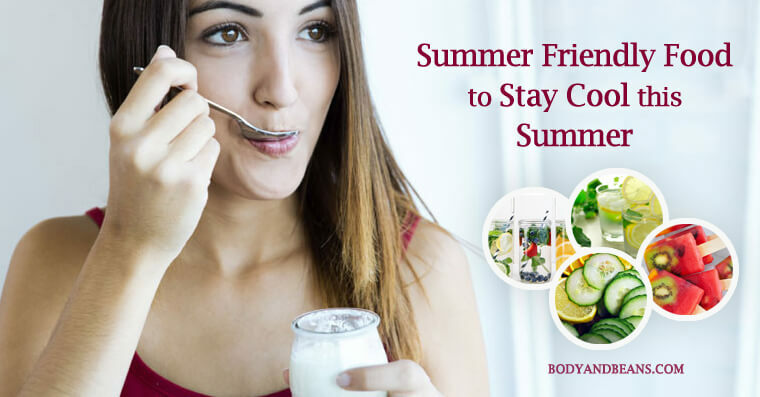 Here are the list of best summer friendly foods worth including in your daily diet to beat the scorching hot days and stay cool this summer. Drink 7-8 liters of water daily. Our body requires comparatively more water in summer because of excess sweating and hence we should drink plenty of water to keep ourselves well hydrated. Have some homemade fruit juice, instead of those which are available in the market. You should have the fruits with high water content like water melons and grapes, more often to beat the heat. Instead of rich and oily foods, have soup because it’ll help you to maintain the hydration of your body and it’s easy to digest. Make lemonade at times, because you may not feel like drinking plain water every time. Lemon water tastes good and hydrates your body well. Make a homemade cream with aloe gel and peppermint extract. You can apply the paste on your face to remove the sun tan, and cool your skin instantly. Water melons and cucumber are some of the most beneficial fruits for summer as they have high water content. Include cucumber and onions in your daily salads. Drink fruit juice without any added sugar. You can have whole fruits, make fruit salads for a balanced diet in summer. Have curd or yogurt instead of creams. Do not drink coffee as it contains high caffeine and caffeine can cause dehydration. If you are drinking coffee, then make sure that you are drinking sufficient water. You can have ice tea or green tea. Tomatoes, broccoli, radishes, spinach are some of the summer friendly vegetables for you. Apples and corns can be included in your daily diet during the summers. You can make lassi with curd, as it helps in restoring water levels in your body. Coconut water and lemonade are rich in potassium, thus they can prevent diseases like heart attack by controlling the blood pressure in your body. Avoid oily and spicy foods, as in summers the body has the tendency to get dehydrated and this can interfere with the proper digestion. So, to avoid the acid reflux or heart burn, it is advisable not to have the rich foods. A glass of cool milk before the bedtime can restore the lost energy of your body. Eating can make your body warmer due to the process of digestion. Eat minimum 2-3 hours before sleeping at night, so that you can have a cooler body. Apart from eating summer friendly, water rich foods, it’s also essential to follow a few healthy habits that may help you to beat the heat more comfortably. Hot sunny days in summer can become unbearable at times. 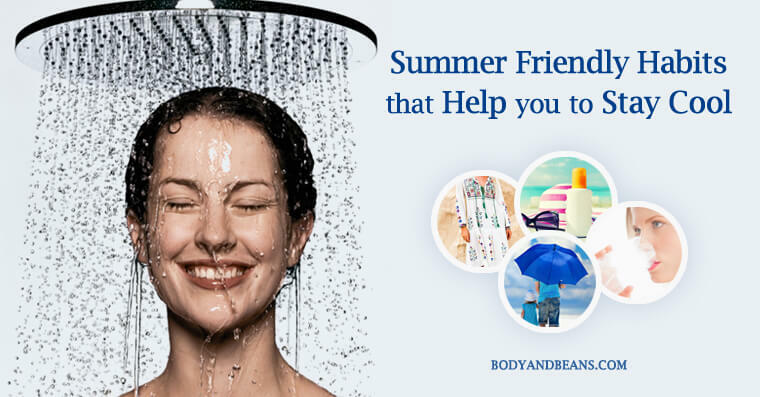 But we can definitely beat the heat with summer friendly living habits. Here is the list of some of the simplest yet best habits you should follow to stay cool this summer. Take shower twice a day, once in the morning and once before the bedtime, it will help you beat the hit comfortably. Cold shower is preferable; add some ice cubes to your bath tub. Wear light shaded clothes, like whites and pastels, which can reflect light and heat. Avoid wearing black clothes as black colour absorbs the heat quickly and it will make you uncomfortable. Wear loose clothes for better air circulation in your body. Wear cotton clothes; avoid georgette, linens, because these kinds of clothes may restrict air ventilation. If you want to protect yourself from the harmful rays of the sun, then cover your hands, face, neck etc suitable cotton clothes and globes. Wear the sunglass, hats, caps, sunscreen lotions etc, to protect your skin from UV rays. Carry umbrella always with you, using black umbrella is preferred. Do not drink chilled water after coming from the scorching sun, or under the sun as this will cause severe fever. Drink water in normal temperature. Make it a point to drink one glass of water every 30 minutes, to keep your body hydrated because in summer your body loses more water due to sweating. Avoid having cold drinks even though they tempt you. These soft drinks harm your body but cannot satisfy your thirst. Don’t forget to carry water bottle when going outside. Do not enter air conditioned room immediately after coming from the sun. Apart from the foods you are eating, there are many other ways to make your body and home cool. And here’s what you can do to make your home cool and comfortable this summer. Paint your rooftop in white colour, so that the heat is reflected. Paint the exterior walls of your home in light shades, and not dark colours, so that the heat and light is reflected. Dark colours can absorb the heat and make the home warmer. Use cotton bed covers, bed sheets, cushion covers and all other fabric. Cotton is the fabric which can help in air circulation. Sleep on white bed covers; this is the summer colour as you can call it. Make it a point to wash the bed covers and bed sheets once a week, as they tend to get dirtier with your sweat. Open the windows of your room strategically so that least sun rays enter your home. Do not open the west facing windows during the noon, as the sunrays will enter in your home. Keep the doors closed as they can lead to heating of the room. Instead of switching on the AC, you can use the ceiling fan, for air circulation. This way you can save the electricity bill. Install humidifier in your room, or cooler. This will make the rooms cooler during the hottest summers. Keep plants in your home, garden, rooms. Plants help in cooling your home. Do not use carpets or rugs during the summer. Walking on the cold bare floors is very comfortable. Pour some buckets of water on the roof; it will make the home cooler. If you have no shade over your roof, then you can install asbestos shade to reduce the heating of the roof. Sweep the floors with water for keeping the home cooler. Turn off the lights when not in need. Avoid staying in the upper storied rooms as they absorb the maximum heat. Stay in the ground floors or basement. Beating the scorching heat of summer is never easy, irrespective of whether you are blessed with an AC or you live without it. Whether you switch on your AC, cooler or fan, it’s only going to help you cool down the place, not your body. But to deal with the scorching heat, not only your home, but your body should also stay cool. We have already discussed some of the best habits and foods that can help you to beat the heat and stay cool this summer. 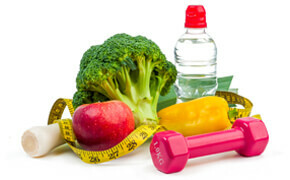 The life habits and daily diet can help you to remain cool from within. What else are you doing to stay cool and beat the heat this summer?